Let’s get together in Atlanta! Folger Education, along with loads of teachers in our big, nationwide family, is heading to the Annual Convention of the National Council of Teachers of English, and we’re sticking around to present at the CEL Convention, too. We want to connect with you and your colleagues and see how we can support your work—the most important work on earth. Hop on the NCTE shuttle to Emory University to see a First Folio from the Folger vault and participate in a jam-packed Folger workshop for teachers. Join our lively sessions on Friday and Saturday. Chat with us and Folger Teaching Shakespeare Institute alums in our buzzing booth (#428). Come to a site TBD (the GWCC or the CNN Center) for a wild Hamlet flash mob, and you just might end up on TV! Two special sessions with the First Folio, which will be exhibited at Emory University. These are free to NCTE conference registrants (no extra cost) and NCTE will bus you back and forth from the conference site to Emory. Learn more and register here. Peggy O’Brien, Mike LoMonico, and Skip Nicholson will be leading these sessions. We’d love to see you there. Our booth in the hall opens at noon! Stop by #428, where it’s all happening from 12:00-6:00 pm. Folger booth buzzes from 8:00am to 5:00pm. Flash mob. CNN. Hamlet. You. Gather at 5:00pm to a location TBD and together we’ll make some Shakespearean magic happen—and have a good shot at getting on TV. The first 100 flash mobsters get a free Folger Edition of Hamlet! Folger booth buzzes from 8:00am to 1:00pm. 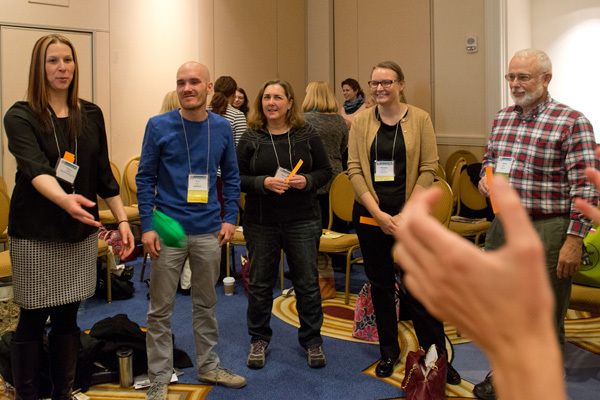 At 11:15am, Peggy O’Brien and Mike LoMonico lead a CEL session on improving how Shakespeare is taught and learned. Forever after: Let’s stay close and keep on collaborating and transforming together! As a learner of english language I want to kee p touch with you. Yes! Please do. Let us know how we can be helpful. We’re at @FolgerEd on Twitter!